"Benefits and Risks of Recent Medicinal Advances"
There are many definitions of medical professionalism. Many older definitions wouldhave encompassed the following three elements - (i) the ethic of service, (ii) autonomy and self-regulation and (ii) benefit to society. Traditionally professionalism in medicine would include a commitment by doctors to keep up to date, maintain and develop their standards of practice and as a group to protect the public interest in enforcing a code of professional practice. Over the last 30 years, as a result of widespread media publicity of medical errors and controversial medical decisions, the public has understandably become less forgiving in their attitude towards doctors. They are also more cynical about doctors' professional privileges which are increasingly being viewed as patronizing and self-serving. In the United Kingdom, the tragedy in the paediatric cardiac surgery department at the Bristol Royal Infirmary and the Shipman affair had led to further loss of confidence in the ability of doctors to regulate themselves. Escalating commercialization of medicine has not helped. Commercial considerations often subvert the core values, practices and behaviors that would exemplify medical professionalism. This tension between commercialism and altruism is a major challenge to professionalism today. Hilton maintained that the authority of doctors had traditionally been derived from three sources1: (i) the moral authority through the undisputed altruism of medical practice (ii) the sapiential authority based on the profession's exclusive ownership of an esoteric body of knowledge and (iii) the charismatic authority exemplified by the consultant and his large retinue of junior doctors and medical students. All these three sources of "authority" have undergone tremendous changes and the profession needs to recognize this. Social pressure has led to more political involvement in the affairs of the medical profession. More and more, other external stakeholders are clamoring for greater participation and say in the regulation of the profession. Doctors can no longer expect to continue to enjoy the relative freedom from lay supervision and interference. Doctors are also in danger of losing the very high social status and esteem that accompanies the profession. There is now a greater demand for doctors to be efficient, effective and economic, be responsive to society's needs and to embrace a quality culture. Many articles and position papers have been published in the last decade on the new professionalism that is relevant to this day and age. Eraut2 had identified the components of professionalism as (i) a moral commitment to serve the client's interest (ii) the discipline to monitor oneself and to review one's practices (iii) the will to expand one's repertoire and to reflect on one's experience (iv) to contribute to one's organization (v) to reflect on and contribute to the changing role of the profession in society. Sir Donald Irvine, the President of the General Medical Council (1995 - 2002) wrote of a new professionalism3 that would involve (i) clear professional values and explicit standards (ii) collective as well as personal responsibility for standards of care (iii) local medical regulation based on teams (iv) systematic evidence of keeping up to date and of adequate performance and (v) adequate and effective systems for dealing with dysfunctional doctors (Vi) the modernization of regulatory bodies, which in the case of Malaysia would be the Malaysian Medical Council. 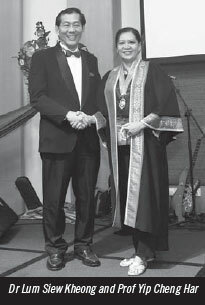 In delivering the 17th Gordon Arthur Ransome Oration at the 38th Singapore-Malaysia Congress of Medicine in 2004, Sir Donald spoke of a patlent-centred professionalism4. Patients are increasingly better informed of their illnesses and expect a more equal partnership between doctor and patient. Among the challenges identified by Sir Donald was the loss of public confidence in the regulation of the medical profession. The conservative 19th century views of the medical profession on matters of attitude and human relationship had remained largely unaltered despite profound changes in societal norms. The profession is still largely introspective and given to only listening to itself and hearing what it wants to hear. The tendency of the profession to close ranks in the face of perceived adversity is, as Sir Donald puts it, a curse of misplaced collegiality. Specialization had led to the various professional institutions acting in isolation rather than in a coordinated manner to plan for the profession as a whole. There is also the tendency to react only after a catastrophic event rather than anticipating such events proactively and put measures in place to prevent them. To meet these challenges it is necessary to strengthen institutional systems to maintain and improve quality of care (clinical governance). Medical practice, education and regulation have to be reformed in line with patient-centred care. Medicine is a vocation in which a doctor's knowledge, clinical skills, and judgement are put in the service of protecting and restoring human well-being. This purpose is realised through a partnership between patient and doctor, one based on mutual respect, individual responsibility, and appropriate accountability. working in partnership with members of the wider healthcare team. These values, which underpin the science and practice of medicine, form the basis for a moral contract between the medical profession and society. Each party has a duty to work to strengthen the system of healthcare on which our collective human dignity depends. The notions of mastery, autonomy, privilege and self-regulation, concepts often articulated in previous definitions of medical professionalism, have been discarded. It identified securing the trust of patients as the important purpose of professionalism. This trust, and therefore professionalism, operates on two levels (i) in the individual providing the care (individual professionalism) (ii) in the system where that care is given (institutional professionalism). Both aspects of professionalism are crucial to secure a patient's trust. The behaviors that strengthen trust include courtesy, kindness, understanding, humility, honesty, and confidentiality. Any deficit of such behavior either in the doctor or health system will undermine that trust. The situation in Malaysia is no different. 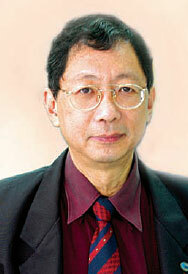 The Malaysian public increasingly views quality care as an entitlement. We in the medical profession would do well to recognize this and make the necessary changes. The change has to start with the undergraduates. Medical schools need to respond to the new realities by adjusting their curricula to promote independent learning, curiosity, reflection, responsibility and accountability to society The learning of communication skills, ethics, team work, evidence-based medicine, patient safety, health promotion and disease prevention as well as the social and organizational complexities of the health system needs to be emphasized. Medical schools must also be courageous enough to withdraw students who exhibit unprofessional behavior despite good academic grades. This learning has to be extended to postgraduate education and maintained throughout one's career in the form of continuing professional development. Even consultants need to constantly reflect and learn from their experiences. As Aldous Huxley had said, "Experience is not what happens to you, it is what you do with what happens to you." We need to be open and transparent in our practices and willing to be subject to practice audits, revalidation and recertification. Change is always painful and difficult and some of us will be reluctant to do so. However if we do not make these changes ourselves; others would probably make the changes for us and this would be far more painful. Hilton S. Education and the changing face of medical professionalism. Sri General Practice 2008; 58:353-361. Erault M. Developing professional knowledge and competence. London. Farmer Press. 2004. Irvine D. The performance of doctors: the new professionalism. Lancet 1999; 353: 1174- 1177. Irvine D. 17 Gordon Arthur Ransome Oration: Patient-centred Professionalism. 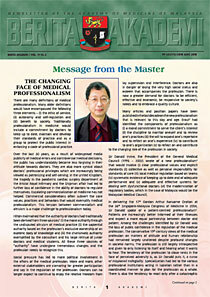 Ann Academy Medicine 2004; 33: 680-685. Royal College of Physicians. Doctors in society. medical professionalism in a changing world. Report of a Working Party of the Royal College of Physicians of London. London: RCP, 2005. 210 Jalan Tun Razak, 50400 Kuala Lumpur. Academicians are welcomed to attend the above. Is is indeed an honour for me to serve as the new President. I would first of all like to express my deepest thanks to the council of the College of Surgeons for their trust and confidence in electing me to lead the College. I would also like to thank Mr Lum Siew Kheong, the immediate past President, for leading the college for the past three years. He has been instrumental in starting many new programmes, the most important of which is the ATLS (Acute Trauma Life Support) Course, and also the Johns Hopkins Travelling Fellowship, and I know I can depend on his continued support and advice. As the President of the College, I will continue the work started by my predecessors, the most important of which is networking among the various specialities of surgery such as Urology, Cardiothoracic Surgery, Plastic Surgery, Paediatric Surgery, Neurosurgery and General Surgery. Under General Surgery, various subspecialties have formed their own societies, such as the Colorectal Society, and the Vascular Society of Malaysia. It is important that all the surgical disciplines (including ophthalmology, ENT surgery and Orthopaedic Surgery are represented in the council of the college and its committees, and work together to recruit young surgeons into the College of Surgeons and the Academy of Medicine. As well as networking among the local surgeons, the College has to make itself visible in the regional and international arena. The International Presidents' Meeting was started by Mr Lum in 2007, and is a forum where local surgical leaders can discuss with their counterparts from different countries and learn from each other about the changes that are occurring worldwide in the field of surgical education, assessment methods, accreditation, credentialing and continuous professional development. The College has also evolved to become a major stakeholder in the surgical training programmes in the country, being an active member of all the surgical conjoint boards, and the various speciality register committees, and continuous professional development bodies. The College has also developed the basic sciences exam for orthopaedic surgery with Professor David Choon at the helm, and this has been accepted by the conjoint board of orthopaedic surgery as an entry examination for the Master of Orthopaedic Surgery programme. As well as training and credentialing, the college also will continue to run various surgical skills courses and encourage the young surgical trainees to excel in their chosen profession. I sincerely look forward to the assistance, guidance and collaboration from all the members of the College of Surgeons and the Academy of Medicine during the tenure of my Presidency. included his widow Datin Khairun, his son Sharman Selvarajah and cousin Dr Ravindran. The College of Radiology (CoR), Academy of Medicine of Malaysia recorded an unprecedented turnout at the Annual Scientific Meeting held in The Legend Hotel, Kuala Lumpur. There were 280 delegates at the two-day scientific meeting and 175 delegates at the pre-congress workshop "A Holistic Approach to Mammography". Whilst the pre-congress workshop was targeted at radiographers (after feedback from the previous year's workshop) with hands-on workshops in five mammography centres; the scientific meeting was attended by radiologists with some radiographers and medical physicists amongst the delegates. During the pre-congress workshop, the breast and cancer support groups were invited to be present with table booths to create awareness of the need for appropriate counselling and support in patients with breast cancer. Ms Jill Denise Miller from Australia was impressed with the enthusiasm of the participants, especially at the workshop, as she felt they really wanted to learn and also at the overall response to the lectures. She was here previously to participate in our CoR quality assurance programme in mammography workshop. The pre-congress workshop was possible with the collaboration of the Ministry of Health, the University Malaya Medical Centre and the Biomedical Imaging and Intervention Journal and with Dr Shantini Arasaratnam as the chair. The Annual Scientific Meeting kicked off after opening remarks by Dr Evelyn Ho, followed by the keynote address by Ramesh Ramchandra Bhonde, PhD - Technical Director of Stempeutics Research Malaysia. He enthralled the audience with his presentation on "Stem Cell Therapy - Bench to Bedside': He has been involved in stem cell research for 20 years, especially the use of stem cells in treating diabetes. Stem cells have infinite self-renewing capacity and potential for differentiation. His passion was obviously in "regenerating hope": In tune with the theme of the scientific meeting, he showed a beating cardiomyocyte (a cell as opposed to a beating heart) and also listed some of the imaging modalities involved in stem cell research such as Magnetic Resonance Imaging, Bioluminescence Imaging, Positron Emission Tomography and Fluorescence Imaging with Quantum Dots. The first day was focussed on the heart with Computed Tomography being the topic in the morning and Magnetic Resonance Imaging in the afternoon. Practical relevant topics were delivered by speakers who shared their knowledge whilst maintaining the interest of the audience through excellent presentation interjected with humour. The faculty consisted of local and foreign speakers, from the cardiology and radiology disciplines. Dr Dieter Ropers was from Germany (Cardiac CT Technology: What is out there? and Coronary CT Angiography: Creating an efficient Workflow in 10 steps) whilst the rest of the speakers were from Malaysia. They were Assoc Prof Dr Yang Faridah Abdul Aziz (Going Back to Basics: Plain Radiography of Cardiac Diseases), Dr Rahal Yusoff (Understanding Cardiovascular Risk Assessment), Dr Liew Wai Fong (Coronary CT Angiography: Anatomy and Coronary Anomalies); Dr Ong Tiong Kam (Reporting CT Angiography: Methods of Analysis, tools of the trade and workflow); Dr Annuar Rapaee (CMR of lschaemic Heart Disease), Dr Alan Fong Yean Yip (CMR and Coronary Interventionalist) and Datuk Dr Sanjiv Joshi (Cardiac MRI: Basic requirements, cardiac orientation and imaging sequences and Cardiac MRI: Pitfalls and Interpretation Errors). On the second day, lungs were the flavour of the day. Emphasis was on the need to discuss with clinicians, and find out more clinical data to enable a better diagnosis to be made because many radiological findings were not specific only to one kind of disease or infection. The morning began with Going Back to Basics: Plain Radiography of Lung Diseases by Dato' Dr Abdul Samad Sakijan and ending with Radiofrequency Ablation of Lung Tumours by Prof Dr Basri Johan Jeet Abdullah. In between, our colleagues from Singapore, Dr Lynette Teo Li San and Dr Kwek Boon Han, as well as Dr Clara Ooi Gaik Cheng from Hong Kong, lectured on Evaluation of Pulmonary Thromboembolic Disease; Pulmonary Infection in the Immnocompromised Host; HRCT Pattern Recognition; Lung Carcinoma: diagnosis, staging and reporting; Solitary Pulmonary Nodules and Imaging of Airway Diseases. In the spirit of the tripartite collaboration between the Colleges of Radiologists/ Radiology of Malaysia, Singapore and Hong Kong, our sister colleges recommended and contributed speakers to the scientific meeting. Members from the respective Colleges were entitled to the local Malaysian CoR member's registration fees. Peak Detection on the Assessment of Breast Lesions Using Single Voxel Proton (IH) MR Spectroscopy at 3.0 Tesla". This main scientific meeting was with the support of the Biomedical Imaging and Intervention Journal. The CoR thanks the support of the industry for making the 33rd meeting of the professional body possible. The main sponsors for the precongress and scientific meeting were Siemens, Delta Medisains, Technology Medical Associate and Bracco. Our other sponsors were GE Healthcare, Philips, T-Medic, Covidien, Diagnostica, Pharmaforte Malaysia, Carestream Healthcare, Glotel, Fujifilm, I-Medic Imaging, Best Contact and Bayer Schering Healthcare. Check out Radiology Malaysia at www.radiologymalaysia.org for more on the CoR activities. The College of Paediatrics, Academy of Medicine of Malaysia, will hold Training the Examiners' workshop (for local Master of Paediatrics clinical Examination) on 10th July 2010 at Postgraduate Examination Ward, University Malaya Medical Centre. 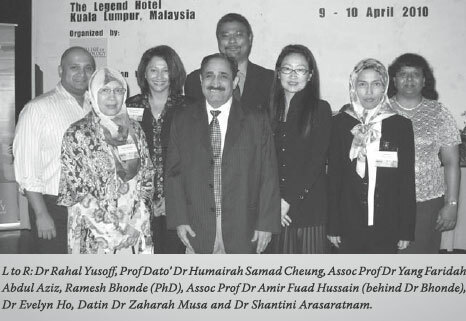 & 4th National Paediatric Research Meeting in December 2010. The above will be held on 12' to 1+t1 November 2010 at the Hong Kong Academy of Medicine jockey Club Building, Hong Kong. All academicians are encouraged to register for this meeting. The detailed programme and the registration form are available from the congress website at www.trpaItitecongress.org. "GASTRQENTERQLQGYIN ASIA PACIFIC - EXCELLENCE IN THE NEWDECADE"